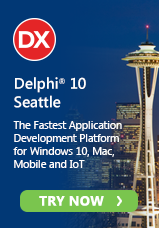 Two new hotfixes are available for Delphi XE, C++Builder XE and RAD Studio XE. This fix corrects the error caused when reading an ftMemo field twice using the InterBase or Firebird dbExpress driver. This fix corrects the error caused when an application with a TClientDataSet and TProvider encounters a negative status code from a database server. They're on there but a little way down the list. There's a way I can override the automatic sort order and move them to the top but it takes some work. I'll do it later today if I can find the time.